Who: Artists Victoria Vesna and Max Kazemzadeh in NYC communicating with Charles Taylor, evolutionary biologist and artificial life expert, in Los Angeles. 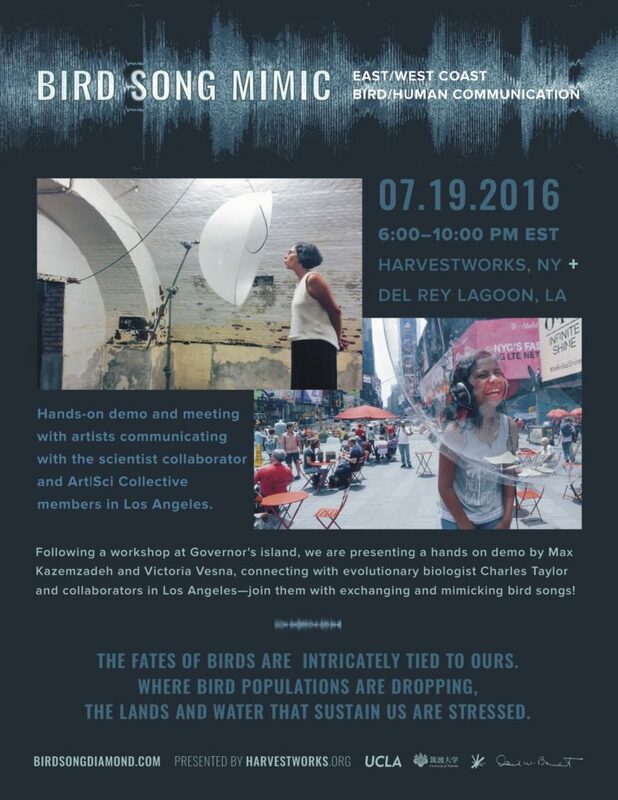 The artists based in NYC will connect in real time with Charles Taylor and the Art|Sci Collective in Los Angeles for an east/west hands-on demonstration of communication and birdsong sharing. This demo grows out of a long-term collaboration between Victoria Vesna and Charles Taylor. Back in 2011, Vesna was invited by Taylor (both professors at UCLA) to join his interdisciplinary research group and help on the NSF-funded project, M apping Acoustic Network of Birds. It took Vesna three years of absorbing, learning and going along with the researchers—recording and mapping bird sounds early mornings in the Santa Monica Mountains—to begin to conceptualize the work. She noticed that her relationship to space changed as she was hearing bird songs in open spaces, both in natural and urban environments, and became keenly aware of how we have edited this acoustic richness out of our daily experience. By working closely with Taylor and his collaborators, most notably physicist Takashi Ikegami, the work emerged as a meditation on our relationship to birds in the natural environment, as well as to the ever-expanding number of artificial birds – drones. The fates of birds are intricately tied to ours. Where bird populations are dropping, the lands and water that sustain us are stressed. Two participatory installations were premiered at Governor’s Island in the summer of 2015 in coordination with the New York Electronic Arts Festival hosted by Harvestworks – a large-scale immersive installation on Governor’s Island and mobile Bird Song Mimic in Times Square. Here media artists Max Kazemzadeh and Joel Ong joined the collective work and the mimic prototype was created. The second iteration of the installation is on exhibit now, presented again with Harvestworks, at Nolan Park Building 5B on Governor’s Island through July 25th.